Preheat oven to 400 degrees F. Wrap the beets in foil packets and roast in the oven until tender, about 1 hour. Open the foil packets and let cool. Once cool enough to handle, peel using a paper towel, then dice. 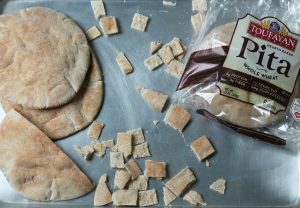 To make the pita croutons: Preheat oven to 375 degrees. In a medium-sized bowl toss the pita chips with olive oil and sprinkle with salt. Transfer to a baking sheet and bake 10-12 minutes or until golden brown. Remove from the oven and cool completely. The croutons can be made in advance and stored in an air tight container up to 3 days. Build your salad(s) by laying down the kale leaves. Top with desired amount of roasted beets, goat cheese, pistachios, tomatoes and the pita croutons. Drizzle the white balsamic vinaigrette over top.